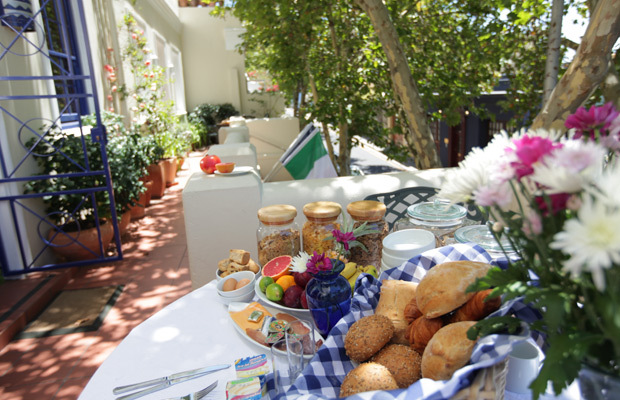 Welcome to 17 on Loader Guest House, situated in De Waterkant Village. Cape Town Guest House. 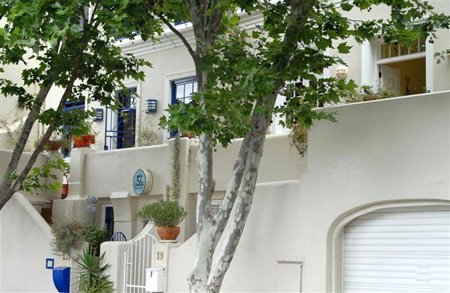 Situated on the slopes of Signal Hill overlooking the Cape Town harbour and world renowned V&A Waterfront this cape town b&b is well known for its unique and original Cape architecture, cobbled streets lined with clothing boutiques, furniture stores, specialty shops, bars, coffee shops, cafes, restaurants and delis. 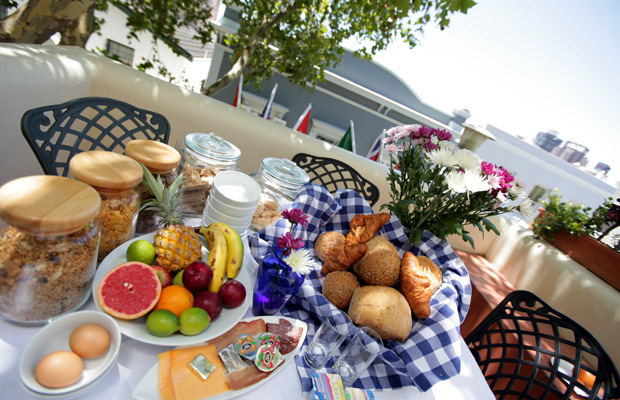 Our Cape Town guest house is conveniently situated within a 10 minute walk to the city centre, the Cape Town International Convention Centre, the V&A Waterfront, several health spas and some of Cape Town’s most popular restaurants and nightclubs. The 2010 Fifa World Cup Stadium in Green Point is within cheering distance. De Waterkant is considered to be a safe area, and is patrolled by security guards 24 hours a day. No 17 on Loader is on three levels and has a large roof terrace with magnificent 360 degree views of Table Mountain, Devil's Peak, Signal Hill, Table Bay, Blouberg Beach, Robben Island, the harbour, the Waterfront and Cape Town city centre. 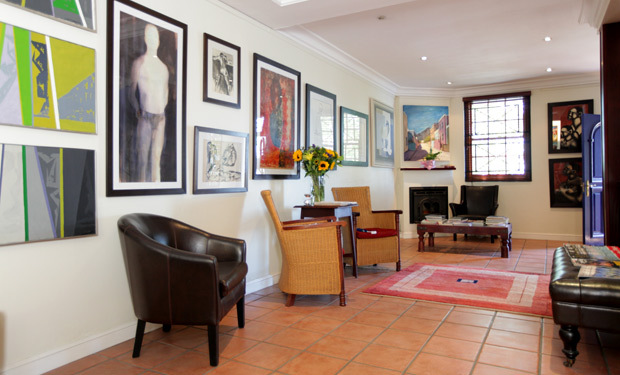 17 on Loader Guest House is also home to a large private collection of art works providing a glimpse into South Africa's rich and varied creative talent. Underfloor heating keeps the guest house beautifully warm during the winter months while huge plane trees keep the property cool during our long hot summers. We offer a variety of accommodation options including self catering units; honeymoon suites; and rooms for independant travellers. Some of the accommodation options are in neighbouring properties exclusively managed by 17 on Loader. 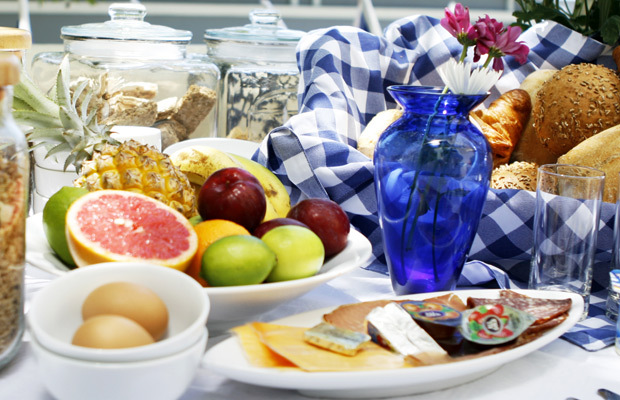 Our rates include a continental breakfast each morning (7AM - 11AM) which is served in a basket for guests to enjoy in their rooms, the roof terrace, the front balcony or the dining room. Tea and coffee facilities and an honesty bar are also available. There are comfortable chairs and loungers on the roof deck, making this the perfect place to have early morning coffee watching the sunrise, or to suntan during the hot days, take a cold shower under our beautiful South African skies, or alternatively, you can enjoy sundowners, and just revel in the beauty that is Cape Town. 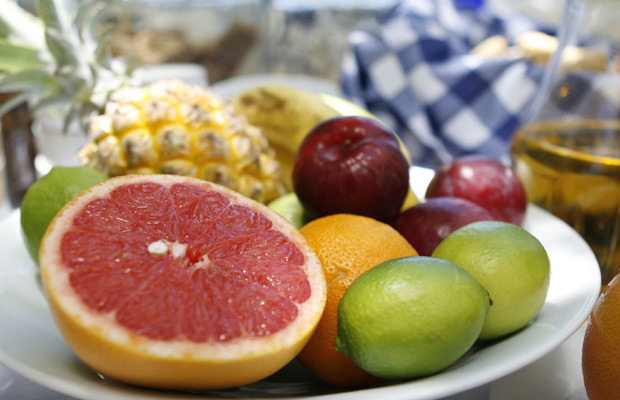 We also offer the following services and facilities: We provide safety deposit boxes; a Wi-Fi zone, cellphone rentals; airport transfers, restaurant and club bookings, visitors' information and recommendations, car rentals, tour bookings and itineraries, sun worshipping or star gazing on the roof terrace, private functions (fully catered) for up to 200 guest functions (barbeques, dinners, cocktail parties) and rotating art exibitions displaying the work of local artists. Should you require any further information regarding these facilities please do not hesitate to ask. Please note there are no cooking or laundry facilities on the premises but these services are easily available in the village. At 17 on Loader we pride ourselves in our levels of service excellence and this, we feel is apparent in our choice of quality bedroom and bathroom furnishings and finishes, our staff and the service we offer. 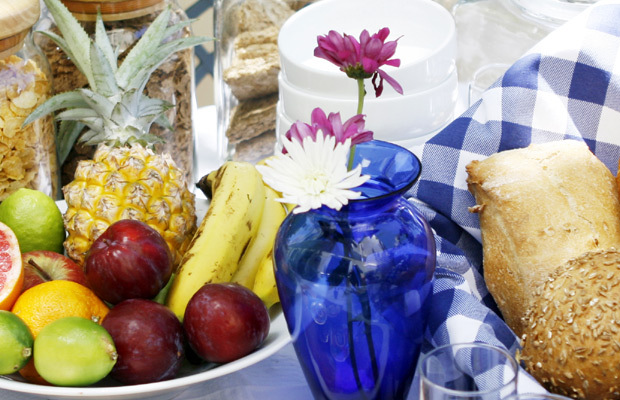 Top rated amongst the Cape Town Guest Houses. 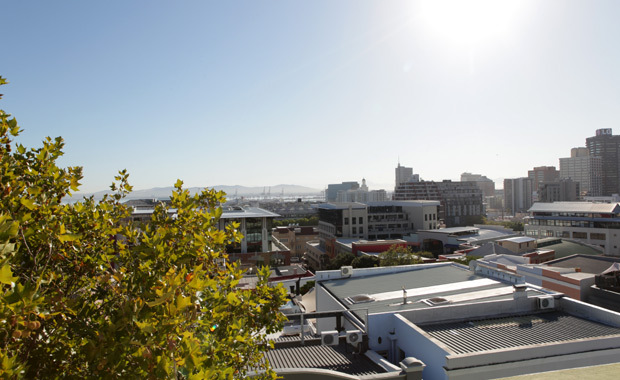 Part of de Waterkant’s rejuvenation has taken the form of the creation of two business hubs – known as “The Cape Quarter Lifestyle Village” - which is also home to a myriad of restaurants. Within these two “quarters” one can find restaurants such as Lazari, Vanilla; Voila , Kuzina, The Cru, Chenin Restaurant Wine Bar , Andiamo, and the La Petite Tarte. Slightly further afield (about 5 minutes walk), one can find other delectable eateries - Table Thirteen, Beluga, Il Leone, and La Pigalle, to name but a few. 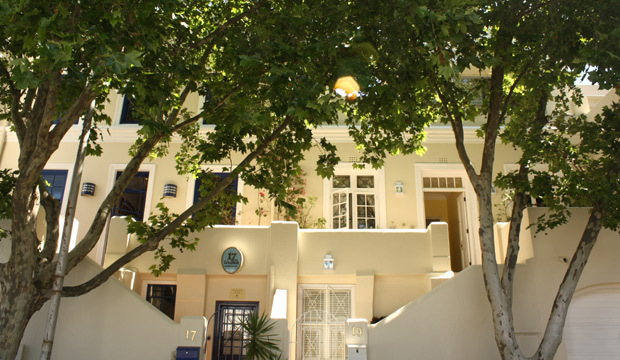 De Waterkant Village has dozens of accommodation establishments, including self catering units, B&B’s, Lodges, Hotels and Guest Houses. These include de Waterkant Cottages, Village and Life, the Protea Hotel Victoria Junction , and of course – 17 on Loader Guest House! De Waterkant has become one of the most desirable areas in which to work – being convenient, trendy, and safe. Some of the big name businesses include de Loitte’s, 140 BBDO, Primedia and Pernod Ricard). However, the bulk of businesses in the area are made up of small, talent-rich and highly creative entities and/or professionals. These include Engage Brandcraft, iLead Model Agencies, Faith Models, datNow’s Attorneys, and NS Digital. What's up in Cape Town?